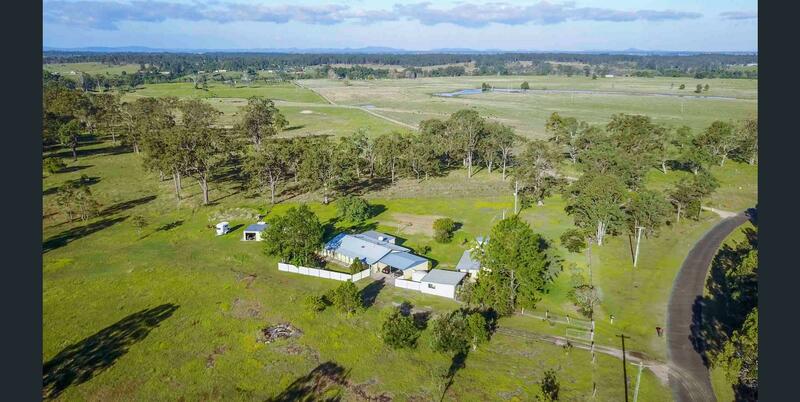 This 15 acre hobby farm is ideally located approximately 20 minutes from Grafton with bitumen road access and on a quiet rural road. neighboring properties are far enough away for privacy and peace and quiet but close enough for a lending hand. This property features a three bedroom home, two good sheds with concrete floor and power, a double bay carport, and a self contained studio adjacent to the house yard. The main home has three bedrooms (two with built-in robes), a modern kitchen with quality Italian appliances, and open-plan living area leading out to a deck which overlooks the countryside below, and is just perfect for entertaining. The two bay carport adjoins the home and is adjacent to a lockable garage/workshop. Another shed sits to the far side of the home, which is currently used as a tack & feed shed. Our vendors have enjoyed having horses on the property, with three paddocks and two dams for water for livestock; plus rainwater tanks on the house for domestic use. The spacious studio has a kitchenette and bathroom, separate driveway access and would be ideal for visitors, teenage children or family members to reside. Copmanhurst village is only about 8 minutes drive and boasts the Rest Point Hotel, general store, parks, preschool and infants & primary school and Clarence River access. This tidy package has a lot to offer for a variety of pursuits and we strongly encourage you to come and have a look for yourself. Please don’t hesitate to call JoJo Newby of Farrell McCrohon Stock & Station Agents on 0417 690 637 to discuss or to book your inspection.